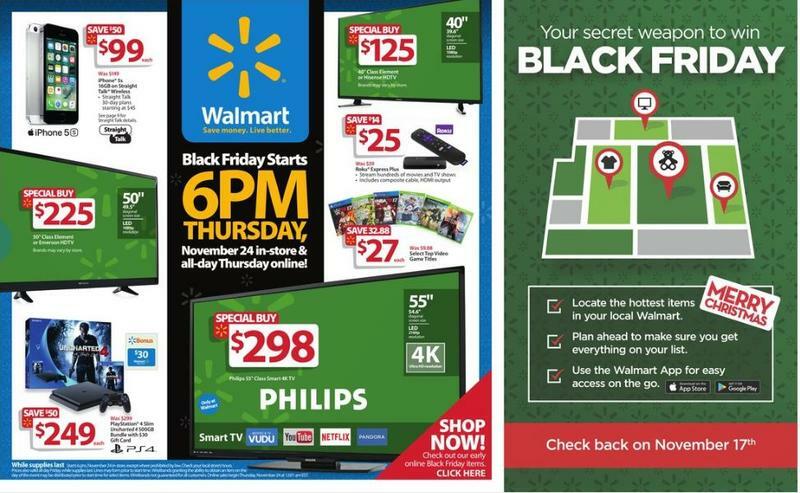 Walmart recently revealed all of the items that will be available in stores come Black Friday. The weekly ad is chock full of tech, including plenty of discounted HDTVs, smartphones, accessories, streaming gadgets, home cameras and more. I took screenshots of the ad, which you can peruse at your will, but there are some standout deals that I spotted. If you buy a Galaxy S7 or iPhone 7 on AT&T or Verizon, for example, you’re eligible for a $250 Walmart gift card. You need to set an appointment ahead of time, however. For folks interested in creating a smart home, the Nest will be discounted from $249 to $199. The Nest Cam will cost $149, down from $299. For gamers, the Xbox One S Battlefield 1 bundle is priced at $249, down from $299. There are more than 65 games priced under $25, too, with many as low as $15 or $8. If you’re in need of a new laptop, Walmart has a variety of Windows 10 machines that are discounted down to as low as $99. Those super-cheap machines don’t always perform well, though, so keep that in mind before buying one. If you love movies, head to Walmart for those, too. More than 260 movies will cost just $3.96. Sure, most of us don’t use DVDs anymore, but if you buy a Disney movie, you can easily grab a digital copy for your smartphone or tablet. Boom, huge savings. And finally, TVs. There are tons of options, including a 4K 60-inch Samsung Smart TV priced at $648, which seems like a pretty good deal to me. Prices range from $98 for a 24-inch display to $798 for a 65-inch Samsung Smart TV, a $200 discount on the latter. Check out the full list in the gallery above, or hit the source to browse the full collection that also includes non-tech items. The sale kicks off at 6pm local time on November 24 in-stores. Good luck.